Learn about the origins of Hoodoo, how we can practice it today. Connect and create . All materials, and a light snack provided $45.00 Suitable for all ages. PLEASE NOTE: we cannot have more than 10 people in this class. I do need a minimum in order to run the class. In addition to being in the live course you will be added to a facebook group that will include practitioners from all live and online classes and you will continue to have access to Trinity and Gaia through this group as long as it is functional. About the Course:Hoodoo is a traditional American folk magick. When people were taken from their homes in Africa and brought to the United States as slaves, they brought with them their indigenous magical practices and melted them with a variety of cultures. Since then Hoodoo has evolved and grown. Hoodoo is not a religion, it is not Voodoo, nor is it Black Magick. Hoodoo is about empowering yourself. Being responsible for your own actions, and making positive change in your life. Hoodoo is a practice which is rooted in Magick ,belief and connection. It is about using all available energies of the Earth. It is about plant magick, (The most powerful part of the plant being the root. )It is about using the energy of the animals, every part of the animal, and every animal, including ourselves. In Hoodoo we honour the ancestors, our ancestors and the ancestors of all those who practised magic before us. The ancestors of the earth. In this course you will learn traditions, concepts, how to’s and whys. This is a hands on course where you will make your own oils, mojo hands, and spells. 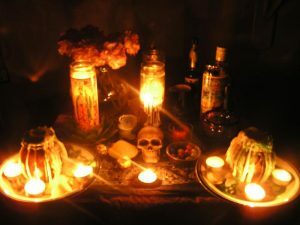 At the completion you will be able to create your own hoodoo spells and rituals. You will be able to weave hoodoo practices within your own spiritual practice.